CNN's Kristie Lu Stout speaks with media shy Linux founder Linus Torvalds on Open Source, future of Linux, Firefox and other interesting things. 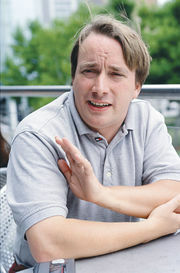 Torvalds, based in Portland, Oregon, works full time overseeing the development of Linux which he created back in 1991 while at university in Helsinki. Here's an excerpt from the conversation about Firefox. CNN: I understand, but let's say your mom or my mom, they're surfing the Internet but maybe they're not surfing with Firefox just yet or they don't really know what Linux is just yet. Linus: Open source is definitely getting to the point where a lot of people who don't actually know about the technology start to know about the notion of open source and start to use the products. Not just Linux, I mean Firefox is certainly the one that a lot of people will have seen because they prefer it, because it's better or because it's more secure or for any other number of reasons. CNN: Another reason, because it's an alternative to Microsoft? Linus: Well that is, I think, played up more than it necessarily needs to be. Because there is a very vocal side to this which is the whole anti Microsoft thing. I think it makes a better story than is necessarily true in real life.